I really, REALLY need to learn this lesson. I’ve already used this hook in an earlier review, BUT I CAN”T SEEM TO BE ABLE TO LEARN THIS VERY SIMPLE LESSON: Do NOT introduce brand new books to a three year old right before bed time! I know what will happen, because it happens every time. I will end up reading the thing three or four times before my daughter will go to bed. See, this is a pretty simple thing to learn. So, instead of learning it, tonight I compounded it. I am pretty well educated and although I have a terrible grasp of English grammar I think that I am a reasonably intelligent person (smarter than a few, dumber than many), so what did I do this evening? I didn’t introduce a new book, that’s for sure. No, I didn’t introduce A new book. I introduced TWO new books to my book-loving daughter right before bed time! Three readings each, plus two bible stories and a couple already on the regular rotation and I get out of there way too late. It’s my own fault. 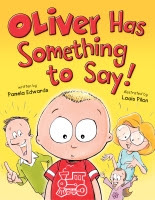 I Don’t Want to Go by Addie Meyer Sanders and Andrew Rowland, and Oliver Has Something to Say by Pamela Edwards and Louis Pilon (both from Lobster Press) have become immediate hits in my house. I need to mention, we don’t reread books unless they are good (in her opinion and mine, but mostly hers). We don’t even make it through books she doesn’t like….those don’t tend to get reviewed here (unless they are just over her head, of course). 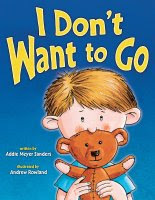 I Don’t Want to Go: It's time to go? OH NO! Joey is visiting his grandparents on his own for the very first time. Nervous about being far from home, sleeping in a strange bedroom, eating new foods, and leaving his favourite toys behind, Joey is absolutely positive this will be the worst trip ever. Little does Joey know what fun Grandma and Grandpa have in store for him if he can find the courage to try something new. Both of these books have important messages that are presented in ways that young will understand and embrace. Note: Also available without the tear-out recipe card, ISBN 978-1-897073-75-9. Presenting, for the first time ever, an interview with the three year old female member of the CitC – Kid’s Book Corner staff, Mariah. 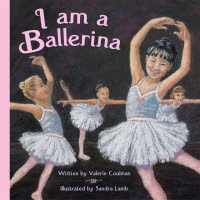 Today I will be interviewing her about the book I am a Ballerina. Comics in the Classroom –Kid’s Book Corner: What’s the book about? Mariah: The ballerina. She is dancing and twirling and she falls. She’s almost a ballerina. CitC-KBC: What do you like about the book? Mariah: I like it, it’s good. I like the almost part. CitC-KBC: What do you think of the pictures? CitC-KBC: What is your favorite part? Mariah: The almost page [The oft-mentioned page where the girl is fist pretending to be a ballerina in front of a mirrior]. CitC-KBC: What do you think about the ballerinas? Mariah: I like the dancing on the stage. CitC-KBC: Would you like to be a ballerina? She is still dancing as I write this…and she is pulling me away to dance. Really. Having to read the book three times in a row and then dancing for 30 minutes. Sounds like the perfect parent/daughter experience to me. This book has one of the most racist jokes I’ve ever read in my entire life. It is not meant to be funny, but the internal monologue that comes next is hilarious – buffalo, ha! What an awful way to start a review. I had a whole paragraph about my time on a far north reserve (technically an off-reserve, but I don’t think anybody has ever cared when I try to explain the difference). It was a pretty good paragraph too. But, I don’t think I am a strong enough writer to walk the line between sharing powerful experiences I had as a young teacher and sounding like one of the two types of teachers mentioned at the top of page 30 in The Absolutely True Diary of a Part-Time Indian (although I would like to add to the list of reserve teachers: “brand new teachers that have no idea what they are getting into but figure it has to be better than supply teaching”, which it was for me, and “teachers running away from their problems in the real world”. There were a few “mobster informants” in the District that I taught in. Sorry, to fully get that you will have to read the book. You may want to skip to the end of this review to see if I think it’s any good though). Okay, I will share this – only to drive home my point, not to make me seem like a guy that “understands what it is like to be an Indian on a reserve”. No, I am a very white guy from a small town that had one family that wasn’t also white and I have never known anything like real hunger or poverty. But this is one thing I have seen that ties in well with Sherman Alexie’s first Young Adult novel. I have seen some things. Arnold (also called Junior), the main character and narrator of The Absolutely True Diary of a Part-Time Indian endures some incredible hardships and talks about things that may make the reader uncomfortable, and the reader may think that things are being exaggerated for effect. Upon my return from my time teaching away I would talk to family members and other teachers about my experiences in Northern Saskatchewan and they would look at me and listen intently, because they were interesting (and at times shocking) stories. But, they always had that tilt of the head that tells you, the teller of the tale, that they don’t really believe a thing you are saying. They don’t believe that a place in Canada exists where a pick-up truck filled with grown men would actually slow down just so they could yell at an eight year old boy about what a whore his mother was – knowledge they gained first hand. Other stories are worse and I’m not sharing them at this time. Alexie has written a terrific novel, one in which it at times it feels like the main character is sitting with you telling you all of his secrets. I mean that it is like a 15 year old is telling you ALL of his life story, which includes pain, humor, swearing and masturbation. Yeah that last one may make you think twice about including it on your high school class’ summer reading list, but what 15 year old doesn’t have lust and hormones leading him around? This is an honest book. It is an important book. If you don’t know about the world Arnold lives in then you should read it and recommend it to young adults that may need a similar awakening. If you and those around you know what it is like to lead the life the people living in Arnold’s community lead, then it might just make you feel a little more understood and connected, and maybe those around you could use a little of that feeling. I may personally wish those few masturbation parts were left out, but I don’t think it would keep me from letting my own kids read it if they were in high school. And I think this is tame compared to what most are being exposed to anyway, but I thought you could use fair warning. In some ways, Part-Time Indian reminds me of Essex County: Tales From The Farm. For instance: being a different kid in a small town apparently means you get called homophobic names a lot. I must mention that this book is heavily illustrated by Ellen Forney. Apparently Alexie and Forney worked quite closely on these illustrations and cartoons, which are meant to be those of the main character who is an aspiring cartoonist. They are used to show what Arnold is thinking in the situation presented in the text. They really add a lot to the book. In summary: Great book. Read it. If some of the content I have pointed out makes you hesitate recommending it to a teen, read it yourself. I'm glad I did.